My tears flow every time I read your post. I want you to know without a shadow of doubt that God is moving in this girl right here. I knew Clay as a teenager through Paul & Melonie. I am going to meet you one day! I see so many friends of mine in your pictures. There is a hunger in my heart for a deeper walk, more surrender, …a heart right here craving the faith, & the love, & the joy that is so evident in your home & heart. The ministry God has entrusted you & clay with, is bringing & will bring so much glory to the kingdom of Christ. 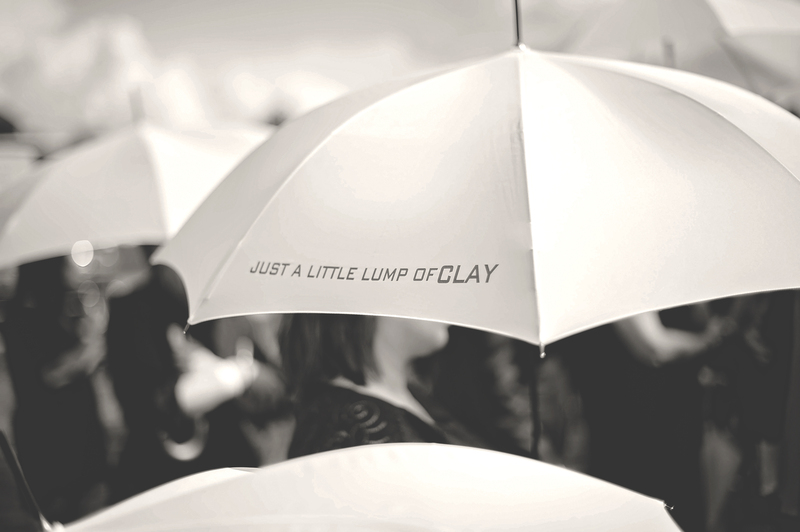 Just a little lump of Clay. a ministry that is ordained, anointed, & birthed through surrender, pain, & total submission to the will of God! Rest peacefully tonight Kristu & Clay , I am praying fervently for Clay. I was a hospice nurse also, so I am praying for specifics, although God knows every need, heavens gates are stormed for you all with prayers! Kristy I lost my Dad in October, and I know the joy with every moment you get…. How precious the time is. Every sweet moment. God is so wonderful . My Dad was 83 & Clay’s sweet spirit reminds me of my Daddy towards the end of his journey here. He loved his visitors. He was surrounded by his wife, daughters, son. sisters, Grandchildren, neighbors, friends, church family , neices , great neices, nephews, great nephews, even a great great granddaughter & great great grandson. Our poodles even stayed at the end of his bed. A family friend said DADDY was evangelizing during his last 5 months he was with hospice. Daddy left a legacy of love, loyalty, submission to Christ, & joy beyond understanding. Daddy was 83. Clay, about 1/2 his age…. Yet Still joy reigns. You & Clay are evangelizing! You are both Amazing. And so very loved. Kristy and Clay, After reading this post tonight, I asked Jesus to be especially close to y’all and let you know what a difference your witness is making in the lives of others. As I travel this road behind Clay, I am so amazed and grateful that, as the challenges increase, y’all continue to think of others and minister to us by somehow finding time and energy to share your experiences and your faith so that His Name will be glorified! Thank you for the encouragement and inspiration you are to me; I’m sure many others feel the same way. And I hope you are already hearing His voice clearly calling you His good and faithful servants! May His loving presence, along with the gratitude and love of those you’re ministering to, continue to support you and encourage you both. I look forward eagerly to the day I can thank you personally as we rejoice together in His presence! I love you Kristy I know it’s hard but stay strong my friend and you must rest to my friend when you can. Our Lord Savior is present he has sent all those loving angels to be by your side … Thanks for updating us and sharing a little lump of Clay..
You al have great friends and a wonderful church family! Most of all a truly amazing and loving God! We don’t know each other, but I keep up,with your blog and what an inspiration it is. ” For such a time as this” your family has shown the Love of God to others in so many ways. I can see Clay still trying so hard to be strong for all of you and be the man he thinks he is still supposed to be even in this sickness. What a Blessing he is to so many people… God Bless you all! When you can’t see God’ Hand, follow His Heart! You don’t know me but the past few mornings at 3am the Holy Spirit has prompted me to pray for you. It’s been such a sweet and sincere time of intercession. My heart tells me that you’re probably being prayed for by someone every minute of each day….. oh how great the love of our Father is for you. Oceans of love and tight hugs from Tampa, Florida. I felt God telling me to share, today. We don’t know each other, although I’m sure we have mutual friends. In the past six months, I’ve been on a Grace journey and learning so much about our Abba God and our Savior, Jesus Christ. This journey has led me to healing messages. I’ve always believed that God can heal and that the Name of Jesus is more powerful than any other. But, I never heard any teaching on the healing principles in Holy Communion. I’ve been blessed with teaching by Joseph Prince on the healing power of Holy Communion and the broken and bruised sacrifice that Jesus made with His body for our healing. What a price He paid. It’s so radical from the way I was raised, that I’ve been reading and listening for a long time without sharing it with my friends. But, God told me today to share with you. Here are the resources if you want to read and listen. This morning I watched this sermon, #77, Discerning the Lord’s Body and took notes. He preached from 1 Corinthians 11:29-30, Isaiah 53:4, Matthew 8:16-17 and John 6. If Clay were my husband, I would want to know these things from the Bible and the heart of God. Most of all, from the broken and sacrificed body of our Lord Jesus Christ. Every time I read your posts, I am reminded that through all struggles, there is also so much joy in the lives that we were given. My daily prayers go to Clay and your family. Amy Morris keeps me posted, but she is only still able to smile because of the joy that she reads in your posts. God Bless you and keep you all close. Thank you for a reminder of God’s true love and Grace.